Applications and websites that have provided bandwidth speed tests have been around for ages, but Speedtest.net takes the concept a step further. With a ultra cool “Web2.0ish” interface you’ll get your upload and download speed displayed on your screen based on a connection with a remote server of your own choice. Speedtest.net measures the performance of your broadband connection. At the end of each test, you are presented with the download (the speed of data from the server to your computer) and upload (the speed of sending data from your computer to the server) bandwidth speeds. The tests are performed completely within your web browser over HTTP (just like normal web browsing). 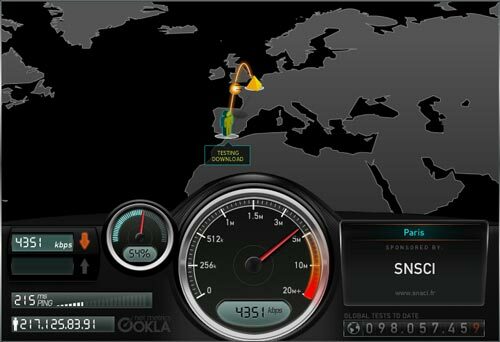 The technology behind Speedtest.net is identical to that of the Ookla Speed Test which is provided to a wide variety of companies and organizations on a licensed basis. Collectively, the application is used over eight million times each month by millions of individuals worldwide. Speedtest.net is a free broadband speed test with servers located all over the world. When you initiate the test it automatically guesses your location and preforms the test based on this. Afterwards you can compare your results with others and easily share them.